Ok, good to go! Now, create a file called package.json.This file serves the purpose of packaging your node project. Here you can specify the project name, author(s) info, dependency modules, node version, etc. There’s an excellent cheat sheet that you can use to package your own project. Express: a web framework for node. It is one of the most used modules in node.js; it takes care of a lot of boilerplate code to build a web app. If you are using views in your project, it expects you to use a template engine. By default, it expects Jade to be used. Jade: a template engine for node. If you know HTML, you’ll love Jade. Briefly go through the docs and you’ll see what I mean. Socket.IO: a module that makes real-time apps possible. We’ll go into more detail later in this tutorial. Underscore: a utility module that has many common operations that you would normally use in other dynamic languages like Groovy or Ruby. You should now have a folder named node_modules. The folder contains all the necessary files and binaries to run your project. This means that now this folder is truly the root folder of your project. NOTE: I’ll comment where necessary; otherwise, it should be self-explanatory. It is a common practice to name the variables after the module name. Ex: http is the "http" module, express is the "express" module, etc. //Handle route "GET /", as in "http://localhost:8080/"
Awesome! We have an HTTP server up and running. Granted, it doesn’t do much but if you have worked with other web frameworks, you have to admit that it was very easy to set up an HTTP server. If you wanted to use an HTTPS server instead, instead of using the http module you would use the https module instead. Yup, is that easy. This is a two-step process. First we have to tell our server that we are using Jade as our template engine. Then, we’ll create the view of our chatroom. //Render the view called "index"
NOTE: If you decide to name the file other than style.css just make sure you also change it in index.jade. //The request body expects a param named "message"
Let’s test our POST method, (re)start the server and call the method at http://localhost:8080/message. I’m using curl as my REST client, but you can choose whichever you want. Let’s test a bad request. This is as far as we’ll go with RESTful services in this tutorial, but feel free to browse through the Express documentation and build more methods or add options to our POST method. So far we have a web server that receives incoming messages that does nothing with them, and a view that can’t even send a message. I think that now it’s a good time to make this a real-time app. Let’s talk a little bit about Socket.IO first. Socket.IO is a module that aims at making real-time apps possible. Long story short, it consists of a server that receives and emits events to all the clients, or just a set of clients, that connect to it. Here’s a list of browser and transport support for it. There are many websites that use Socket.IO, however, an excellent implementation of it is Trello. Fog Creek Software, its creator, have an excellent post on the website’s tech stack, including comments on their implementation of Socket.IO. It is definitely worth a read. NOTE: I’ll comment where necessary; otherwise, it should be self-explanatory. Also, I’m not going to explain jQuery, you can go to Codecademy for that. They’ve got excellent tutorials. On client init, try to connect to the socket.IO server. Woohoo! We now have a socket.IO server along out web server and successfully connected a client to it. 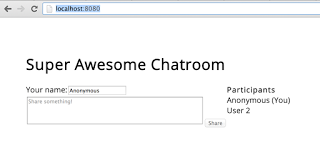 We can now finish our chatroom! rest should be named after its module name. The list of participants in our chatroom. When a new user connects to our server, we expect an event called "newUser"
When a user changes his name, we are expecting an event called "nameChange"
I think the code and the comments are self-explanatory. If not, let me know in the comments section to update it accordingly. 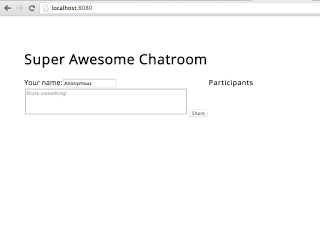 Let’s finish this chatroom by extending the index.js file with the events we just defined. the participants section and display the connected clients. Note we are assigning the sessionId as the span ID. Aaaaaand, that’s it! 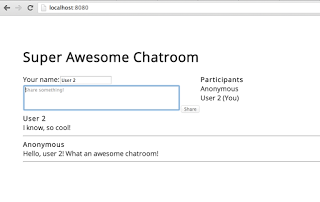 (Re)start the server and see our chatroom in action! 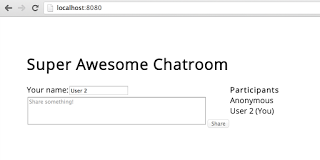 Your super awesome chatroom is now complete! 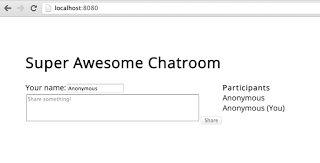 Note that this is a very basic implementation of different node modules, and also know that this chatroom is vulnerable to XSS and you should at the very least add an HTML sanitizer if you intend to use it for a real-world application. 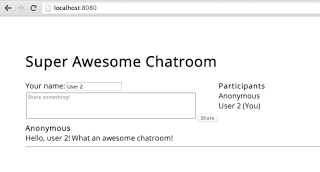 What I would like now is for you to be creative and add events, styles, and cool functionalities to the chatroom. Share them all in the comments section or let everyone know what you thought of this tutorial! Thanks for reading this far, I put a lot of effort into making this tutorial. If you liked it, I would really appreciate it if you could help spread the word by sharing this post.